What Is a Good Dog Walk? Recently I’ve been doing some day training with a few different client dogs (I take them on training walks minus their owner). It’s gotten me thinking about what I look for, really, when I’m walking my own dogs or any dogs- what does a good walk feel like to me and how would I define it. There are a few behaviors I look for from my canine companion and they coalesce nicely into a few distinct training games that I like to play when walking a dog. Nearly any basic manners class you enroll in (including ours) will focus a significant part of the curriculum on teaching your dog not to pull on leash: teaching the dog to keep the leash slack. This is a very important skill and one that I work on extensively with clients by treating the dog for staying at their side, but it also isn’t everything. I’ve walked dogs that haven’t pulled at all and yet I’ve still felt completely invisible and like my being there was really incidental to the walk. This to me is not a good walk: loose leash walking isn’t enough, but it’s a good start. The other skill that I frequently build into the beginning of walks, especially with a new dog, is a quick response to me saying their name. If I need to get the dog’s attention, I want a quick “Fido!” to be enough to make them look around at me. The last thing I want is to be faced with something strange or unpredictable coming our way and me standing there saying “Fido Fido Fido Fido”, while Fido completely disregards my existence. It’s annoying and it’s also dangerous. A quick round of “Fido!”, looks at me à click, treat solves this problem nicely and starts out our walk with a connection. One of my biggest pet peeves is when I stop and the dog just keeps going. It tends to be uncomfortable (if you have a large dog who pulls you over!) or at least indicates to me that while I might be walking with a dog, the dog is really just walking… I work almost immediately on stopping, waiting, and when the dog finally turns around to see what the heck is going on, clicking then treating. It doesn’t take long for a little tension on the leash to cue a check-in. I don’t actively cue the dogs to look up at me at intervals while walking, but I do like it. Just an acknowledgement that we’re both still together and that we’re “working” on a common goal: a good walk. This usually arises through training the previous two behaviors. As the dog starts to realize that I frequently reward for looking at me when cued (either by voice or leash tension), they start checking in on me if there is no cue. At that point I’ll often offer them a cookie, or a little sweet talk, or an ear scratch- depending on the dog! It really doesn’t matter much to me if a dog is a bit in front or a bit behind me. I don’t mind if they stop and sniff and check out the world. I just find it very difficult to walk with a dog that doesn’t seem to notice I’m on the other end of the leash. These four behaviors have really emerged for me as the cornerstones of a good walk. What about you? What behaviors do you like to get from your dog while walking? How Do I Muzzle My Dog? How do you muzzle your dog? Here are some tips. Should I Muzzle My Dog? Should I muzzle my dog? An often misunderstood tool that can really help boost training and make it safe in tough or unpredictable situations. My Dog's Holiday Wish List - What Does Your Dog Want for Christmas? 4. An unattended litterbox. Sigh. She IS a dog, after all. I just hope Santa denies her this one! 6. A new kitten. What can I say? She's a sap. She has looooved the kittens we fostered and the one we adopted since getting her. So I would bet this would be on her list. Happy Holidays from Dog Willing! What are you getting your lucky pup this year?! Why Are Tricks Important for My Dog? One of our newer offerings at Dog Willing has been our Tricks Class. It's a more recent offering because it's harder to "sell" to people than our Basic Manners or Level 2 Manners classes. Many people that get dogs now realize that they have to train their dog to have the companion that they envision and a roommate that they actually enjoy having around! However, what isn't immediately apparent to people is why those dogs should then move on to taking classes like agility, nose work, or tricks. As an owner of two working breed dogs- I can attest both personally and professionally to the importance of these classes! As city dwellers many of us have little time to take our dogs to a place where they can explore, sniff, and run around off of a leash. Many of our clients don't have a yard for their dogs and many dogs don't enjoy the dog park. Especially as the weather gets colder and the streets less walkable- what is your plan to keep your dog occupied and exercised? It's hard! Tricks (and the other higher level classes) are a great solution for this. They work your dog's brain! Think about it from your perspective- while many of us enjoy a day off, we also often spend it doing something that we find interesting- reading a book, rock climbing, hiking with friends, or going to the beach. If you can't get out- do you get more fidgety if you just sit and at the wall or if you're actively engaging your mind in something? It's the same for our dogs- when their exercise regimens drop, their mental tasks need to increase to keep them happy and behaviorally sound. Many dogs without this type of stimulation end up engaging in behaviors that we don't like such as barking, chewing, pacing, attention-getting behaviors, etc. By taking a class and working on other skills, you can help avoid this boredom and these less desirable behaviors. It also helps build your relationship. After basic manners is done, many people slide on their training, spend less time engaging with their dogs, and start to expect them to be more sedentary. While this is all well and good, it also decreases the time we spend building our relationships with them- and isn't that why we got a dog? By teaching them tricks it engages us with them and also gives us a way to "show them off" to our friends and family - which always makes me proud of my dogs!! So try it out! Chase away those winter blues- find a class (either with us or one of our other great local trainers on www.netrainersnetwork.org) and engage your dog's mind! Trust me, it'll be fun! Why Should I Choose Clicker Training for My Dog? One of the hallmarks of our program that stands out as somewhat unique in the Cambridge area is that we strongly recommend (although don't require) the use of clickers in our classes. So much so that we hand them out to every client that walks in the door. Why do we do that? 1. The dogs learn faster. We're all learning all the time to be better trainers and part of that is being able to communicate effectively with our dogs. When we can accurately pinpoint the behavior that is being reinforced, the training is easier and the behaviors are cleaner. The clarity of communication between the dog and the owner and the ability to view mishaps in training as errors in communication as opposed to a "problem with the dog" mean that people tend to have fun! Class is supportive and we enjoy problem solving with you when you or your dog hit a road block. 4. You can train almost anything. Think of a cute trick or a useful skill (like something that a service dog could do)- chances are it can be trained using a clicker. We can use this neat little device to pinpoint such tiny changes in behavior that we can shape new behaviors relatively rapidly by playing a type of "am I getting warmer?" type of game with the dogs. So why doesn't everyone use a clicker? Some people simply don't like having to carry a clicker when training and prefer to use a word like "yes". While this can be very effective, it doesn't work quite in the same way, and carries some drawbacks. The dog will not have the same reinforcement history with one person's "yes" as another person's- so if there are multiple family members training, some will get better behaviors than others if they do more training. It's also hard to keep emotions out of verbal cues- that edge of frustration, delight, or anxiety can creep into the "yes" and change it's value. I often get questions from new dog owners along the lines of "but won't I always have to use a clicker? "- and the answer is "no". I rarely pull out my clicker to train my own dogs (they wish I would more often! ), because I no longer need the accuracy in communication- they know the behaviors that I ask of them very well and simply maintaining them with other reinforcement is enough. Sometimes, people also worry that if they don't have their clicker on them, their dog won't respond. This is also not true. Because the click always comes after the behavior, it doesn't matter if you leave your clicker at home- your dog should still respond, just make sure to reinforce in other ways. When it comes down to it- there are many ways to effectively reinforce and train your dog, but at Dog Willing I like to see happy owners and dogs- this is achieved best through clicker training, so that's what we use! Why Shouldn’t I Punish My Dog? This is a question that many people ask – either of themselves or their trainer. And it’s honestly a really good one. Typically, when people approach me to help train their dog, they have already decided to try positive reinforcement for one reason or another. Oftentimes someone recommended they try it; sometimes their vets suggest it; other times they’ve done some research themselves- but whatever the reason, they’ve often already chosen he type of training techniques they would be comfortable with using. But what about the people that haven’t “decided”? They deserve a very clear answer on why trainers like me prefer to use positive reinforcement techniques when training dogs- especially when training aggressive, reactive, or strong dogs. Terminology. Terminology is boring. It’s laden in jargon and tough to decipher. That being said, it’s also important when deciding how to train your dog. What is punishment? Punishment by definition means that if a behavior is followed by something aversive the likelihood of the same behavior occurring again is decreased. A 6-month-old puppy jumps up on a person at the door. The person says “NO!”. The puppy jumps up five more times. Question: Has that behavior been punished? The answer is no. It may not be something I would do, or would like to see other people do, but in reality, this is not “punishment training”. The future frequency of the behavior did not decrease. My guess is, the puppy didn’t care and may have even found the attention rewarding! A 6-month-old puppy jumps up on a person at the door. The person say “NO!” The puppy runs away and hides in the corner. The answer is Yes. The exact same scenario- but a different dog. This dog found the “No!” to be aversive and the jumping behavior decreased. This is the very definition of punishment. Whether or not this is ethically correct or not is up to you. From my perspective, given that there are ways to train a puppy not to jump without scaring them, I would classify it as unnecessary and therefore unethical. Why scare a puppy? At the same time, I do not think that the person who said no is a bad, dog-hating, person. They just may not have the variety of training tools and knowledge to handle this behavior in a more elegant manner. That’s what trainers are here for- to help you find better, more enjoyable ways to help your dog! But, WHY? Isn’t saying “No!” and scaring the puppy effective? The answer is a definitive yes in the second scenario. I don't use aversives because I don't like scaring dogs, there are better ways, and there are very real side effects to punishment- not because it is ineffective. Think of kids that tantrum when they’re told “no”; people that lash out when someone tries to pin them down; dogs that re-direct and bite their handler when they are poked or “corrected”. This is the biggest reason I avoid punishment. I don’t want a dog to aggress at their owner or someone in the vicinity due to a reaction to punishment. With a dog that gets yelled at every time someone walks through the door- how long until they decide that people walking through the door are scary and should be chased away? This is the puppy that ran away and hid in the corner. What about the next time someone comes through door? Do you always want your dog to hide from newcomers? What about a dog that won’t return to their owner when called, because by the time they get there, the owner is always angry and annoyed. Avoidance is real- and a really big problem with using these techniques. I want my dogs to want to be near me- not fear that being near me might result in pain or distress. This is huge. It’s also one of the reasons that it is so impressive when “traditional trainers” make the switch to training using more modern and less aversive techniques. When you punish a behavior- the behavior decreases. If your goal was to stop that puppy jumping- wow did it work! Whether punishment works is NOT the question. By it’s very definition it works. The question is whether it’s the best way. But we feel very powerful, very in control of the situation, and very clever when we manage to stop behaviors that we find annoying. And if it worked in that situation, why not in another situation? What if I say “No!” when my dog is barking? Is pulling on leash? Is aggressing? When something effectively punishes the behavior of our dog, it is reinforcing to us. This is so insidious and is exactly the reason why people that train with these techniques continue to do so. Punishment is not right or wrong. It is not good or bad. It has no value judgment and it’s an important piece of learning. We know to watch our feet when getting on an escalator because we tripped once and our inattention was punished. We don’t pick glass bowls full of boiling water out of the microwave because we tried once and got burned. Punishment is integral to learning in many, many ways. Where I don’t believe it should be used (at least not without an extremely good reason, several concurring behaviorists, and a very solid plan) is in dog training. Where it belongs the least is in basic manners courses or in dealing with fearful or aggressive dogs. Train people to be good, effective trainers, and they can enjoy their dogs and build that relationship instead of having to be in the situation of being their dog’s punisher. One of the most common problems I get called in for is a dog not returning to their owner when called. This problem can be anything from annoying, like when a dog won’t come in from the yard; to life-threatening, like when a dog slips out the front door. This is probably the most important skill your dog can learn and one that is straight-forward to train, but also easy to mess up through inconsistency or inattention. Tip #1: Take a Basic Manners Class. If you’ve never been to a class with your dog, this might be the time to try it. Learning basic communication skills through training will help your dog in all areas of life and make your relationship with them more fulfilling. It’s definitely a good place to start if you want to do any training, including a recall (another word for Coming When Called). Tip #2: Feed the Crap Out of Your Dog. Seriously. This is not the time to be stingy. It’s not the time to train with kibble. Go to the store, buy weird, freeze-dried dead animal parts, cheese, hotdogs, and delicious sandwich meat and give it to your dog when they come to you- every time. Think about what you’re up against- your dog might be choosing between you and a squirrel- do you really think they’re going to choose kibble? This is exactly the behavior that it’s worth investing calories in, and at least initially, feed them every single time you call them when you’re outside. Tip #3: Stay at the Park. After you call your dog and feed the crap out of them, let them go play again! Many people have wrecked a perfectly well trained recall by using it to remove their dog from the park. It doesn’t take very long for a dog to realize that coming to you means the end of playtime. Call them lots, feed them lots, and then let them go play some more. When it’s time to go, go get your dog and put them on leash. Don’t ruin all your hard work. Be aware of your training environment. There are times when even the best-trained dog will fail to recall due to legitimate challenges in their environment. When starting this with your dog, a short distance in a non-distracting environment will serve you best. Gradually work up to being outside (on a long leash), in a fenced area, and eventually at the park or in the woods. Just don’t expect your dog to be able to come away from the middle of a rambunctious play session the day after you start training. It takes time to build up to that- in the meantime work where you know your dog can be successful. Tip #5: Refresh and Rebuild. Sometimes when we have lived with a dog for a while, it’s easy to stop carrying food, stop reinforcing these good behaviors, and just start expecting them to do what we want because they “know”. I’ve been guilty of this and I bet most trainers have. The fact is, that even if a dog has learned a behavior in the past, if you stop reinforcing it, and the squirrels keep running away- the dog is going to start choosing the squirrels. So when you feel your recall slipping, go back to basics and Feed the Crap Out of Your Dog. Many training centers (including Dog Willing) offer Reliable Recall clinics- just a class or two to focus on this particular aspect of training- to brush up on it and rebuild that training relationship with your dog. The mighty Kong is a dog toy that is nearly as ubiquitous as dog leashes- they seem to be in every pet store I've ever been into- and for good reason! This red (usually), hollow, rubber dog toy is a dog-owner's best friend. I use Kongs frequently with my own dogs and recommend them to all my clients. I'm not affiliated with them, nor have I been paid anything to write this, but I believe the Kong is something that every dog owner should own. The Kong is a valuable distraction, brain-drain, and toy for your dog; but it is also the easiest way to reinforce your dog for quiet good behavior. As they lie in their crates or on their dog beds lick-lick-licking away at this doggy-popsicle, they are learning that lying quietly on their bed gives them access to all the goodness that you stuffed inside their Kong. Talk about the ultimate lazy dog trainer's tool! Stuff a Kong, freeze it, crate your dog, and voilà- your dog is training themselves to be well-behaved! There are many other self-feeding toys (like this) on the market and I encourage you to find the one that works best for you and your dog, but this does tend to be a good bet and you can buy them anywhere. The Kong website has loads of information about what you can stuff in a Kong. I don't really care for their branded Kong filling (neither do my dogs) and many of the recipes seem a bit complicated, but there are some really good ones on there. In general, my favorite easy recipe is: dog kibble + plain non-fat yogurt + a few liver treats. Mix it all together and dump in a Kong! My dogs LOVE this one. I'll also mix kibble in with a can of pureed pumpkin (zero calories!) or just mush it up with some water or wet dog food. If I'm feeling lazy, they still sometimes get just canned dog food or some peanut butter; and occasionally to challenge them I'll stick a whole carrot through the hole before freezing. I find that it's best not to overcomplicate things (because that way you have the materials on hand), and to use this in place of meals so that your dog doesn't get too many calories. I typically freeze all of our Kongs to make them harder for the dogs to empty, but if your dog is new to Kongs be sure to start them out with something nice and easy- peanut butter, canned cat food, cream cheese- and don't freeze it. Once they're Kong-addicts, you can start stuffing them full and freezing them. I know that part of my preparations for the holiday is a freezer full of frozen Kongs and it definitely makes our time with lots of visitors that much merrier! How do you prepare? Clicker Train Your Cat - Really?! So here's my deep, dark secret as a dog trainer... I'm a cat person. There, I said it! It's not that I'm not also a dog person, but honestly, my first love is cats. 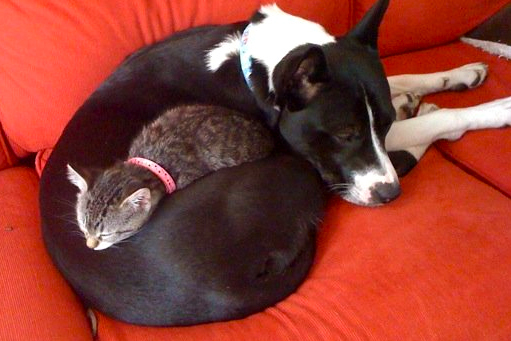 We never had a dog growing up, but we always had two cats in the house. I still feel that a home just doesn't feel right without at least one cat wandering around and sitting on laps. Why am I telling you this? It's not to discredit myself as a dog trainer, I assure you, but it is to tell you that when everyone else thinks training your cat is silly and gimmicky, I'm totally behind you 100%- I LOVE cat training! Cats are eminently trainable and respond extremely well to the clicker. There are some other things you have to consider- their diets are different, they can't have their feeding schedules changed frequently, and they definitely do not train at the same "pace" as a dog- but don't let that hold you back! They are definitely plenty smart, and I'm sure you can figure out some food they will train for. Think back- what were you cooking when you couldn't keep that darn cat off the counter? There's your reinforcer! Alternatively, my cats love the new Friskies Crispies treats, which are also tiny, low calorie, and chew up quickly. I always find it interesting how willing people are to accept problem behaviors in their cats that they would never accept from a dog. Probably the ones I hear most often are behaviors like eating off of counters, scratching or biting when they're being pet, dashing out the front door and into the street, and constantly demanding attention when you are trying to sleep or work. Why do people accept this in a cat and allow the cat to make them change their lives to accommodate the behavior? I would encourage you to break out the clicker and treats and come up with a plan to make your fantastic feline the pet that you truly want to have around. And no, using a water bottle is not the way I train a cat! No more than I believe punishing a dog is the best choice, do I believe punishing a cat is a good idea. I haven't managed to convince many people of this, but my sister, Elinor, is one of them. She has two gorgeous orange tom cats that rule the roost in her apartment. One day she was expressing frustration that one of them would not leave her alone when she was cooking. I suggested ignoring his pleas for treats, treating him for staying away, and gradually pushing it out until he could wait until the end of the meal and then give him a cookie for waiting her out. Given how easily the cat had trained itself to be irritating, it was somewhat unsurprising that only three days later she was back, raving about the nearly immediate success she had had! Her life was immediately made less annoying, and even better than that, she started to realize that all the other behaviors she found irksome could be changed! It's amazing what a little training will do... and keep in mind, if you don't train them, that cat will train you! And, it's not just about problem behaviors- How cool is it to have a cat that will jump through a hoop? Spin on command? Or, high five? Have you trained your cat to do anything useful or cool? I've trained several useful behaviors in mine (sit, go to mat/stay, come when called, touch my finger with their nose), but I haven't trained anything cool yet- that's next! What about you? Happy cat training! And, I promise, I'll head back to dogs on my next post. And lastly, a comic for you... Untrue, but it's the thinking that I want to change! How Can I Fit All This Dog Training Into My Day?! Okay, when you decided to get a dog you knew you would have to train it, but really you had no idea how hard that would be. So now you signed up for a dog training class or found a trainer (good for you!) but they’re giving you all this homework and how do you have time to do that every day? This is a very common problem, and one that I think can be mostly mitigated by carefully slotting 1-5 minute training slots in throughout the day. Yes, you will still have to spend some time training your dog, but hopefully that is part of the fun of dog ownership! Dog Training Happens. Dog training happens every single time you interact with your dog; use this to your advantage. Every single time you feed your dog, give them fresh water, let them out of the crate, put on their leash, open a door, pet them, or cuddle them in your lap you are training your dog. They are constantly learning what works and what doesn’t work in order to gain access to things they want. Here’s an example. You put young Fido on leash and go to the door to take him outside. Fido is super excited for his walk and starts leaping at the door- whining, barking, and flinging himself against the door in a fit of puppy enthusiasm. You, as a concerned puppy owner, quickly open the door and let him charge down to the sidewalk to start his walk. What did your puppy just learn? How, in his mind, did he get the door to open? Fido has learned that the only way to open a door is to perform this set of puppy antics. In this scenario, I fully expect that Fido will still be leaping and throwing himself at the door when he is a fully grown dog, because otherwise how will it open? On the other hand, what would Fido learn if you stood there and waited until he realized that this behavior wasn’t working, and stopped momentarily to look at you, and in that instant of calm, the door opened? What about if as you approach the door you asked him for a sit and then opened the door? Would your life be easier and less stressful if by the time Fido weighs 90 lbs he had learned that the door opens when he is calmly sitting or standing by it? I bet it would be. This same scenario could be replaced with behaviors and consequences like pawing at your leg to get pet, jumping up on you for cuddles, or begging under the table for food. Each of these is a situation where you can teach your dog that another behavior can grant access to these wonderful things, but that the behaviors you like won’t get them anything. You will still have to do your homework, but you should spread it over the course of the day, not try to do it in a single one-hour session when you get home from work. Here are some things I recommend to my clients. 1. Your dog will benefit more from training spread throughout the day and setting aside a block of time can be really difficult, so don’t try to do it all at once! Break it up into short 1-5 minute sessions. 2. Choose one behavior to reinforce 10 times before breakfast. Use the kibble from you dog’s bowl and have them work for it. Small, quick behaviors are good for this (like sit, down, or touch). Then choose a different behavior to reinforce 10 times before dinner. 3. When they're on leash and ready to go out for a walk, pick another simple behavior to do ten times before leaving the house. You should already have treats with you for the walk, so it doesn’t take any extra preparation. 4. When you’re out for their walk, stop at red lights and ask for two behaviors. Choose to stop every three block or thirty steps (or whatever interval you like) and ask for some of the behaviors you have worked on. Occasionally step suddenly back and call them to “come”! 5. For training your dog to lie on their bed, set up the bed next to the couch when you're watching TV and give the dog a treat on it when they come over to investigate it. If they stay and lie down keep treating them. If they wander off- no problem, but if they come back, drop another treat. This will start to show them that hanging out on their bed is the best place to be! 6. Teaching your dog to walk on a loose leash does take dedicated training time, but you can do this during times when you would be out walking them anyway. If you really don’t have time, you might want to consider hiring someone to do “day training”. This is something that I (and several other trainers in my area) offer. For a fee, a trainer will come to your house and work with your dog while you’re at work. Will you still have to train your dog? Absolutely! But their training will progress much more quickly if they are being worked on with a professional during the day. Training is extremely important and needs to start early and happen often. Please don’t underestimate its importance and do figure out how to find the time. Your dog deserves a good life and this is the easiest way to ensure that that’s what they get! What Do You Want Your Dog to do Instead? It is often assumed that positive trainers, and especially clicker trainers, can’t work with serious problem behaviors. Critics assume that once you have an aggressive, jumpy, or constantly barking dog, you have to resort to punishment-based training in order to “dominate” your dog and make them stop. This couldn’t be further from the truth! In fact, of all the dogs I work with, the ones that display the worst behaviors are also the ones that most desperately need the type of training I offer. Serious problem behaviors are often a result of fear, anxiety, and/or poor socialization. Therefore, punishing these dogs is often the worst possible way to train them – you will end up making them more fearful and anxious, even if you can suppress the superficial problem behaviors. Doesn’t punishment work, though? Yes, in a manner of speaking – if it’s done harshly enough, you can suppress problem behaviors by yelling at your dog, hitting them, jerking on a leash, kicking them, shocking them with an e-collar, choking them with a chain, or any other of a myriad of ways that people have come up with to punish dogs. Unfortunately, when you do this, you are not addressing the underlying problem. What you are doing instead is teaching the dog that when they bark, growl, lunge, or snarl, they will get punished. That is all okay until the day when the dog feels like it has to react strongly, and the only option left to it – the only behavior that hasn’t been punished over and over again – is biting. Ironically, these are the dogs that supposedly “bite out of the blue,” because all of the dog’s warning signs have been suppressed through punishment. Is that really a viable training route for a dog that you want to feel safe around? Once you ask yourself this fairly straightforward question – What do you want your dog to do instead?– the behavior plan for your dog begins to take shape. For example, instead of kneeing your dog in the chest for being happy to see visitors and jumping up on them in a very natural and exuberant doggy fashion, try training your dog to sit a million times over. Then start working on the sitting behavior around the door and with visitors. Now, your dog will still be happy to meet your friends, but will also know how to act appropriately, without any punishment needed.This type of training still takes time, consistency, and a good understanding of the methods involved – it is not a magic bullet. However, you can see how thinking in this way changes your dog’s problem behaviors from something that you have to punish them for, to something you can fix (and even enjoy fixing) by training your dog to perform different behaviors.I know that when I decided to adopt dogs, my plan was never to live with animals that I would have to bully in order for them to fit safely into my household. I really don’t believe that most people want to punish their dogs. However, they have just been led to incorrectly believe that punishment is necessary by well-meaning but misinformed friends, trainers, or what they see on TV. Rather than resorting to punishment, I encourage you to get creative and ask, What do you want your dog to do instead? Figure out what behavior you want to reinforce instead of the problem behavior. You will feel much, much better about the way you are treating your dog, and your dog will love you even more for the many ways in which they can earn treats, pets, and attention for being such a good pup! Have you ever had one of those moments where everything kind of explodes? This week, something happened in my house that, in one hour, brought home years of hard work and training with my oldest dog, Beskow. On Tuesday, our two children had their first day at daycare ever, my husband’s family was in town, and I was gearing up for the BACB certification exam. All of those were good and exciting things, but they also introduced multiple elements of stress into the house. For about a week prior to this, my dog Beskow – who can be anxious even on a good day – had been acting particularly stressed and having some stomach issues, so that morning I switched her over to chicken and rice, thinking it would help her. Fast forward to three hours later, when we returned from daycare and lunch with the grandparents… and walked into the foulest smelling house ever. Please forgive the description, but our poor dog had managed to completely explode from both ends! Meanwhile, the kids were both upset because it was naptime, my husband wasn’t feeling well, and I was anxious to get to my studying. Thankfully, Beskow had been crated, so the mess was contained. The baby gates were all installed, so we could keep the toddler OUT, and the other dog could just stay in her crate while Beskow -- and the room around her -- were thoroughly cleaned. After a quick discussion with my husband, punctuated by Beskow’s continued vomiting, I drove her over to Angell Memorial Animal Hospital. Because Beskow isn’t good with other dogs, I left her in the car while I waited our turn inside. When we were called, I went out, leashed her, and put her muzzle on. I’ve only used her muzzle a couple of times, but with her stomach so upset, I couldn’t use treats to manage her discomfort over the other dogs in the building. The Angell staff weighed Beskow in the lobby and my wonderful pup only whined and pulled towards the nosy spaniel poking its head around the corner trying to sniff her. Three years ago, she couldn’t tolerate a dog at the other end of the street without a full-blown, barking, lunging attack (but that’s a story for another day). She was fantastic with the vet once we went to the room. “Leaving” all of the food my toddler has dropped on the floor since then- she is still on a limited diet. When I got this dog, she could not accept crating, I didn’t have baby gates, and she pretty much freaked out in every other one of those situations. She rarely wears a muzzle, but a couple of years ago I trained her to wear it, just in case. It really is remarkable how these moments of total (in this case, disgusting!) chaos can suddenly show us the value of the time spent working with our dogs. I hope that you never have to deal with this type of incident, but realistically, in a life full of dogs, cats, kids, and everything else- these moments can happen, and always seem to arise at the most inconvenient of times! That’s when you will realize just how grateful you are for all the work you put in to make your home a safe and comfortable place for your dogs and your children. Kittens and Crates and Dogs... oh my! Last week we brought a new kitten into our home. “Laddie”, as he has been dubbed, will eventually be moved to his permanent home with my parents, but we wanted to get him acclimated to the dogs, cats, and kids at our house before moving him into their (mostly) quiet home. This is important because I (and my six siblings) visit often with our families and pets in tow and my parent’s cats are expected to handle that change without major stress. So far, Laddie is fitting in beautifully (as you can tell from the photos), but it has required a lot of management to keep everyone happy and safe. Although my dogs have never shown any aggression towards cats or harmed a hair on their heads, my bigger one, especially, can be a little overbearing in her adoration. 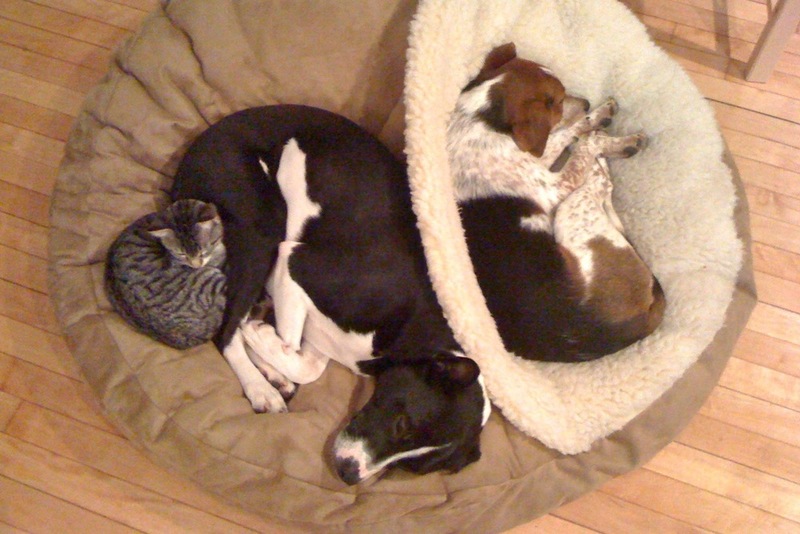 To manage this, the dogs have been spending some time in their crates and the kitten has been spending time in his. This gives them each some time to be out without the stress caused by being together. This got me thinking about crate training. Assists in house training- for the moments when you cannot pay 100% attention to your dog. Helps teach your puppy to stay quietly on her own. When you introduce a new animal or baby into the house, you don’t have to monitor your dog every moment of every day- you can crate them. There are lots and lots of reasons to crate train your dog- this is only the start of what is an extensive list; but it all boils down to: It provides a safe, comfortable space for your dog where they can be happy away from you. How can that be a bad thing? 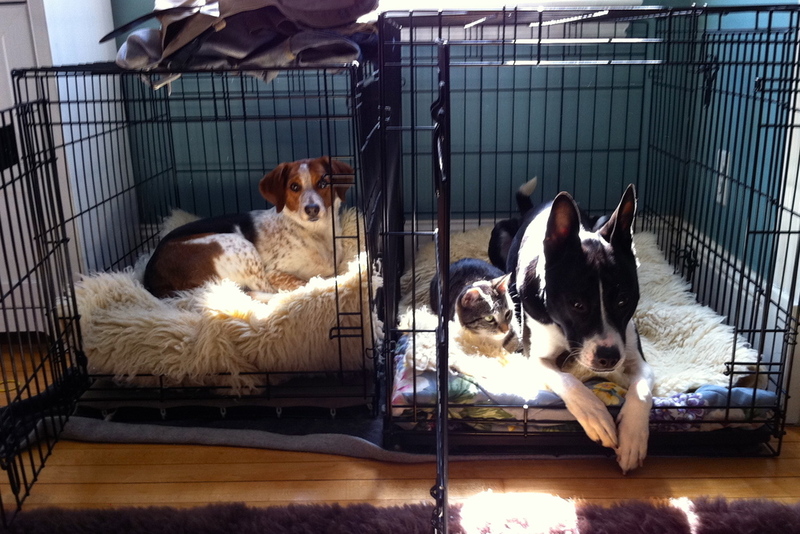 Teaching your dog to love their crate takes training. Don’t throw them in, close the door, and wait for them to stop howling. That’s one way to make sure they don’t like going in. Give them tasty kongs when they’re inside, start slowly so they don’t feel trapped, and try to do many small, short practice sessions while you are home. The ASPCA has a page about how to crate train your dog in a weekend here. Yes, your dog should love their crate, BUT your dog should not spend the majority of their lives in a crate. At most, my dogs are crated for 4 hours at a time. When we have busy days, I have a dog walker that comes by and lets them out to pee and stretch their legs. They also are no longer crated at night (honestly, they kind of monopolize the bed… :p), but they were when we initially brought them home. If crate training isn’t working out for you and your dog, it is worth consulting a professional positive-reinforcement trainer. In my opinion, this is a vital skill that every dog should possess, even if it is eventually rarely used. Here are some gratuitously cute pictures of our animals and Laddie, a picture of me training the kitten, and even a couple of links to youtube videos. I’ve finally decided to begin my foray into the world of blogging. As a small business owner, dog behaviorist, mom to two sons under two, and elementary educator, I feel that I bring a relatively unique perspective to dog training. There are already many great blogs out there about dog training, dogs and babies, parenting, and so on, but I want to add my voice and give clients and potential clients a chance to read about my thoughts and training style. There are many, many topics to write about in the world of dog training, and while I can’t wait to get started, it’s also a little overwhelming. I started a “welcoming new baby” blog post, and it developed into so many different bullet points covering such a wide range of topics, that I’ve now decided to break it down into several different posts. You can expect to see those here over the coming weeks. So, why, with a 17-month-old toddler, an 8-week-old infant, two jobs, three cats, and two dogs, have I decided it is the ideal time to start my own business? In short, because I’m living in the type of situation that I hope to help other people deal with! While I can never have exactly the same experience as someone in another home, with different dogs and different children, I do feel I can empathize with them and have a wealth of relevant experience to draw on! I also just finished my degree in Behavior Analysis and can finally call myself a behaviorist without hesitation. I can teach you how to train your dog and offer you behavior plans for your pets with a confidence that what I am telling you is truly based on solid, respectable science. There are so many good trainers and so much good information out there, that I really hope to share what’s available and educate people on how to communicate with their dogs. This can be done without attempting to read their dogs’ minds, trying to sort out whether they are the “pack leader,” or channeling some magical “energy” to influence their dogs’ behavior. Behavior is behavior. We now know it’s a science with demonstrated principles, not magic. I can teach you those principles, so you can understand how dogs learn – allowing you to enjoy your dog, your baby, and your whole family dynamic without nearly as much stress. With rewards like that, this seems like a great business to be in!